A colorful combination of cherries, strawberries, raspberries, blueberries and blackberries with mint, lemon and flavorful spices. This simple, fresh salad is great all by itself, or paired with non-dairy ice cream or yogurt! In a small bowl, add lemon juice and spices, mix well. Set aside. Place fruit in a mixing bowl, top with with mint and lemon juice mixture, gently toss to combine. Pairs great with non-dairy ice cream or yogurt! Store leftovers in the refrigerator, will last 2 – 3 days. Serves 6 (1 cup serving). 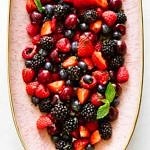 Use any combination of berries, or change the amounts using more or less of each. This is just a template. The fruits were naturally sweet on their own and didn’t need any sweetener. If you find your cherries and berries are not very sweet, add 1 – 2 tablespoons of sweetener of choice. Add it to the lemon juice, or drizzle/sprinkle it over top of the salad. Use orange juice in place of lemon for variation.